Halloween has always been a favorite holiday around here. It has become more fun in the past years with little kids around to dress up and introduce the holiday traditions. Halloween parties are always fun, and more and more are happening that are really family friendly. Here are some fun ideas to liven up your own party or to take to a friend’s party to have some fun. These are all easy ideas that can be made with items on hand or some from your local dollar store. al black ones, but I have also seen assortments of spider rings in many colors. I found a bag that had some purple, green and orange mixed in with the black! Use your imagination! There are often bags of goodies that you can find at the store, it doesn’t have to be limited to just the spider rings. Just make sure whatever favor you pick, you choose one that won’t get ruined being soaked in water. The ice cubes are made in a regular ice cube tray you most likely already have. 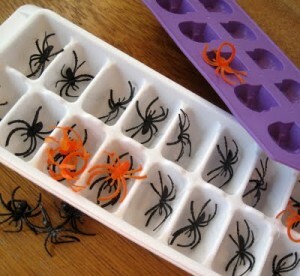 Just place one spider ring in each ice cube section and pour water over! To make it even more fun, I will often use the juice or punch that I plan to use at the party and make ice cubes out of that. So when the ice melts, instead of watering down your juice, it just adds to the flavor. There are many recipes floating around online, so use your creativity. But this is a great and easy way to add some fun to your party. Another fun treat that you can use for a party or even trick-or-treaters is ghost lollipops! This is an easy craft that you can get kids involved in making. You just need some suckers from the store, some white fabric (or tissue paper), some ribbon, scissors and markers. The squares need to be big enough to cover the suckers to make their heads with enough leftover to make the body. 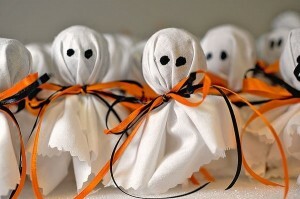 You will tie your ribbon blow the head of the ghost and then add a face with the markers! This is an easy and fun craft that has been around since I was little. Whatever your Halloween plans end up being, these are easy crafts that can be done with some cheap supplies. That is always a bonus when planning for a party, or for special treats to be handed out to trick or treaters. Even if you don’t have a party, it would be fun to make the ice cubes to have for a special Halloween dinner! These ideas can be used any time of year, just swap out the spiders for another fun prize and accessories can be added to the ghost lollipops to make them almost anything! Just remember to have fun! Fall has arrived – Time to get Crafty! It is that time of year again! The weather is starting to cool down and the leaves are starting to change colors. The change of the season is always a favorite time of the year, especially when you have some little kids at home to enjoy it with. 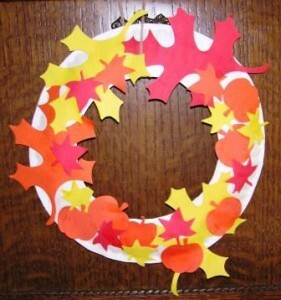 A fun activity to do with toddlers or older kids is a fall wreath. Best part…you can most likely make it with items you have around your house! A fun way to prep this activity would be to take your child on a walk around your own neighborhood to talk about the changes they see. The conversation can be turned towards fall by talking about the changes in nature around your own home. Things will start to look different, and even smell different! You could also bypass the paper leaves and have some fun collecting leaves you find on the ground to add to your wreath. This is all just a fun way to tie the art project into things that are going on in the world outside your home. Start your wreath by cutting a circle out of the center of the paper plate. You will want to poke a hole with your scissors to leave the outer ring intact. The paper plate will make up the form of the wreath. The next step will be to gather your construction paper and cut out leaves from the colors. Use some green, brown, red, orange, or yellow paper to mimic the colors your child saw on their walk! The leaves can be various sizes as well. Just make sure enough are available for your child to have a variety to choose from. Then have your child sit down at a table they can do crafts at. Some younger children may do better sitting in a highchair or booster seat. Depending on the individual child, they may be able to apply the glue to the wreath form themselves, or it might need to be done for them. But they should have fun putting leaves on the wreath form! Encourage your kiddo to spread the leaves around and fill up the wreath. And if more glue needs to be applied, then go for it! This wreath is going to be artwork! When the wreath is all finished, it needs to be laid flat to dry overnight. When the wreath is dry, have your child help you pick a place to put it in the house. You could even cut out multiple plates so that your child can give a wreath to a grandparent, babysitter or neighbor. It is a nice way to embrace the entrance of fall! These wreaths would also make a great art piece for the front door or window of your house. Kids take so much pride in their works of art, they will be so proud to show it off! Lately it has been pretty stressful around our house. Our five year old daughter has all of a sudden been on her own agenda each day. She thinks the world revolves around her and she doesn’t have to do anything other than what she wants to do. When I correct her with her wrong actions it’s a constant battle and often times I feel defeated at the end of the day as if I have given her complete control of the situation. So after some research I have found a few key points that are crucial if you are experiencing the same type of thing in your home. Keeping your composure and not overreacting is extremely important in this type of situation. Even though it might be difficult at times, your child is in a very vulnerable state to copy everything that you do. So if you yell back at them, even though you are correcting their actions. They are just going to continue to think it’s okay to yell as well. If your child is yelling at you something you could respond with is, “I think you could find a better way to say that.” By you yelling back at them it will only add to what ever frustration might be the root of their behavior. Children want to feel like they are in control of their own life. 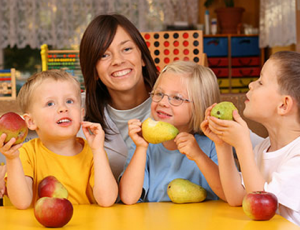 If at all possible during the day give your child options to make their own decisions. “Would you like to wear shorts or pants today?” “Would you like a sandwich or soup for lunch?” By letting them make their own decisions they will begin to feel like you are including them and allowing them to make their own big kid decisions versus you always deciding for them. If your child says something that is not acceptable in your house. Be sure you draw the line and make it known that we do not say that in this house. It is extremely important to set limits with children and stick to them. If you don’t stick to the limits that you have set forth, your child will more than likely become defiant because they know you are not serious. It is also important to communicate in a calm fashion that every thought that runs through their head does not need to be verbalized. Whether it be the way someone looks out in public, or how something tastes when you are at a friends house having lunch. Set limits with your child and let them know what is acceptable and what is not. Always try and focus on the solution. Be sure that in your child’s calmer moments you try and understand why they act the way they do. Maybe the reason they don’t stay in their bed each night isn’t because they don’t like their bed, but because they see monsters on the wall. If so, buy them a nightlight to take care of the problem. Try to focus on how to get to the bottom of their problems versus always fighting them and thinking they are just being a little brat. There is almost always a reason behind it all. Got Toddler Troubles? Read this great article on keeping your toddler busy! Traveling a far distance with a toddler can be a daunting experience. After having taken my one year-old on several cross-country flights and a week-long road trip, I felt it would be nice to share some of our successes and failures in case there are any parents out there who are gearing up to bravely take their little ones on their first big trip. As far as places to stay go, I can’t stress enough how much more convenient it is to find a hotel that either offers suites with a kitchenette, which is ideal, or a room that has a refrigerator. Your toddler is going to need somewhere for their milk and other perishable snacks and food. This is beyond difficult to deal with when you are limited to ice machines and coolers. Having experienced both options, I would gladly pay a few extra dollars for the luxury of the refrigerator amenity. When it comes to flying, there are some things to consider. We have successfully maneuvered our baby boy through long flights and flights with layovers. There are benefits to both depending on what kind of kid you have. A flight with layover gives you the opportunity to stretch your legs and take a break from the plane atmosphere. A direct flight makes for a much shorter day of travel. While a layover can be a nice break, it can also make for a super long day because switching planes takes an hour at least.